The public transport system in Rome is well developed. The metro only consists of 2 lines however there are more than enough bus routes and several tram lines. The notion that the buses and trains in Rome are unpunctual is usually just a cliché. Of course there are the occasional delays but not more than in other large cities. One should also be prepared that the public transport in a metropolis like Rome can during peak times be full – just like in other cities. In comparison to Germany or other countries travel fares are very cheap. A single ticket for an adult costs just 1 Euro. 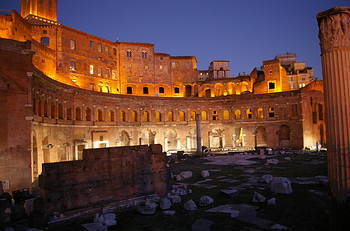 For visitors to Rome – especially for those only taking a short trip, the ‘Roma Pass’ is recommended. It is a travel card that is valid for three days from the point of issue to midnight of the third day. It costs 16 Euros and is valid on all public transport in the city of Rome – the metro, the subway, the buses and the trams. Particularly interesting for tourists is the fact that the ‘Roma-Pass’ gives free admission into two popular museums and discounted entry into numerous other museums and attractions. One can also obtain day-tickets that are valid from point of issue until the end of the day. Before travelling the ticket has to be validated. If one intends on staying longer, then a weekly ticket is recommended which is valid from the day of issue until midnight of the seventh night. Likewise this ticket needs validating before one can travel; additionally one has to fill in personal information and the period of validity on the ticket. One can obtain tickets from the main railway station- the ‘Stazione Termini’, at numerous other outlets and from more than 200 machines throughout the city. Another small tip: one should keep hold of single tickets and only dispose of them after reaching one’s destination, as ticket inspections very often take place when leaving the station rather than on the trains themselves.